Disclaimer: The characters Leonardo, Michaelangelo, Donatello, Raphael, Splinter, Oroku Saki, April O'Neil, Dan Pennington, Charles Pennington, Chief Sterns, and Casey Jones as used in this novel come from Teenage Mutant Ninja Turtles, the first movie. The character Keno as used in this novel comes from Teenage Mutant Ninja Turtles II: The Secret of the Ooze. The character Mitsu and the Norinaga family come from Teenage Mutant Ninja Turtles III. The characters Lotus Blossom and Mona Lisa originated with the Teenage Mutant Ninja Turtles cartoon series, The Purple Dragon Gang originated in the original Eastman and Laird comics, Oroku Nagi was mentioned in Teenage Mutant Ninja Turtles Movie Storybook by Katharine Ross. I revised their origins to fit these novels. All the above characters belong to whoever holds the rights. I'm not trying to steal them, just borrowing them for a little while. I wrote these novels out of my love for the Turtles and their universe. Allie Baker, Zack Baker, Billy Baker, Clin-san, Sammie Yutang, Taro, and all other characters belong to me, so please don't borrow them, but feel free to draw them and send me a copy of the artwork. 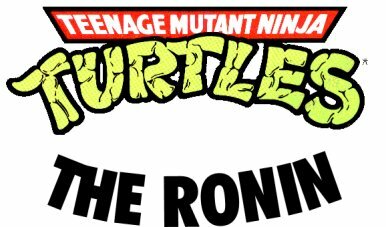 Note: Teenage Mutant Ninja Turtles: The Ronin takes place three years after Teenage Mutant Ninja Turtles: Bloodlines. Zack Baker slammed the van door shut and stared up. And up. The Gothic building with its ornate gargoyles and foreboding look seemed out of place in modern-day New York City, but it suited his sister's dark views and pessimistic frame of mind about life. "All this place needs is a dark and stormy night with a few well-timed flashes of lightening and rolls of thunder. What do you think, April?" April O'Neil brushed back her red hair with her fingers and gazed up at the dormitory. "Well, Allie, you sure know how to pick 'em. Are you positive you want to stay here?" Allie Baker pushed up her shades and propped them against her blonde hair on top of her head, revealing her sharp, blue eyes. "You live with someone three whole years and see how far they trust your judgment? You two act like I've just given you my new mailing address and it said the Twilight Zone." "I wouldn't be surprised if it did," Zack muttered. "Lighten up, I'll be fine. I'll even keep a clove of garlic and a crucifix in the room if it'll make you feel better." "All I want to know is if you've shown Mikey this place yet?" Zack grinned, his dark, almond-shaped eyes crinkling humorously at his older sister. He loved teasing her about her relationship with the Teenage Mutant Ninja Turtle Michaelangelo, because it always sparked a reaction from someone. But at least he knew when to quit, unlike some people or mutants. His finally-hit growth spurt left him just a few inches shorter than Allie, something that would probably be rectified in the next couple of months. "Not yet." Allie found herself staring at her little brother, not so little any more. His mental growth was just as obvious to her as his physical. Three years, Splinter and the Turtles' tutelage, Shredder's attacks, and her leaning toward a normal lifestyle had helped metamorphosed the boy from the vulnerable and idealistic child to the strong and idealistic youth. A change Allie was content with. "But knowing how Mike knows me, he'll probably just ask when visiting hours are." Zack chuckled as he headed around the Turtle Van. April and Allie had managed to borrow it without any Turtles so they could move Allie to the college campus, and he didn't want to know how they had managed it. No one seemed to think it was a good idea for Allie to move out of the neighborhood. Zack figured Allie was just tired of the Turtles assuming they had to watch her constantly. It made sense with the fact that she was becoming less authoritative with him lately. And Mike agreed with Zack's opinion, and he knew Allie better than anyone. But if it was all so simple, why did Zack have the nagging feeling that Allie wanted more from this place than just an education and an escape? "I still don't understand why you can't live at home and commute," April admitted for the umpteenth time. "It would ease a lot of worries. Maybe the Turtles should keep an eye on this neighborhood." Zack caught a glimpse of Allie's expression as she grabbed a suitcase and moved it to the sidewalk. She looked everything but thrilled about that suggestion. "April, please don't put any more pressure on the guys just because you're worried. They have enough to deal with thanks to the Shredder. I'm going to be fine." Allie gave her guardian a quick squeeze for emphasis. "Besides, if I don't live with Sammie, who will?" "Good question." They whirled around and the slim, Asian-American girl laughed. "Surprise! I figured it would be easier for us to move in together." "Huh," Zack grunted. "You just wanted extra help carrying your stuff up three flights of stairs." Samantha Yutang laughed. She always found Zack amusing; the poor kid had to have a sense of humor with a sister like Allie. "It's not my fault my parents divorced before they could give me a little brother to take advantage of. Though, I always told Mom she should have adopted you when we had the chance." She ruffled his straight black hair. "You would have blended in a lot better." Allie laughed, "Sam, you're an idiot." "That maybe true, but you're the only one I've ever let call me that." "Let's check out this place." April exited the suite's beige bathroom and reentered Allie and Sammie's dorm room. The walls of the two rooms of the suite were painted pale green, and the foyer matched the bathroom and the neutral corridor outside. April approved, it made the place look less like a Vincent Price movie. "Not bad. Sure beats the dorm I had back in college." "You didn't find Dracula or Lestat lurking around anywhere did you? I heard you looking." Allie let the pillow drop into the pillowcase and threw the pillow onto the bed. "Is it my fault you make everyone worry about you?" April searched Allie's blue eyes for something but, as usual, the girl was blank. The only time April could read Allie was when she lost control of her emotions, which had happened infrequently during the time she had lived with April. Michaelangelo seemed to be the only one who knew the state of Allie's emotions just by looking at her. Sometimes, April suspected Splinter could too, but he never proved her suspicion right or wrong. "It's not like I'm dropping off the face of the planet," Allie commented dryly. "I'll probably be back on weekends and I'll still hang out in the Lair." Zack grunted as he staggered into the room carrying a large, unwieldy, and apparently heavy box. He managed to set it on the floor, then massaged his lower back as he straightened it. "Gees Allie, what did you put in that thing?!" "It's a graduation-and-going-to-college gift from Mike," she explained as she slid it against the wall and out of the only walking path into the room that was steadily filling with boxes and suitcases. "What'd he give you, his shell?!" "Could someone give me a hand with this?" Sammie grunted at the door, bowed over by the weight of the cardboard box that's bottom was threatening to burst. Allie and Zack leapt forward, balancing the box between the three of them and guiding her into the room. They set it down against the wall gently. "Um, thanks. That's the last time I try to pack everything in one box." She seemed cheerfully, despite having almost thrown her back out. April found herself wondering again what had triggered the friendship between Allie and Sammie. Samantha Yutang was a petite girl with almond-shaped, dark eyes, and long, free-swinging, black hair. She always laughed at her own antics and April couldn't remember a time when she hadn't seen her with a smile on her face or offering advice to someone. What she and the tragedy-stricken-and-trying-to-hide-it Allie had in common, April couldn't begin to fathom. "Is that everything?" "Yes," Allie answered, trying to hide the sudden gleaming in her eyes. "That's all of my stuff," Sammie answered. "But I better make sure I parked my car in the right lot." She quickly left them alone in the room. Zack sighed, "I'm not one for touchy good-byes, Sis. So I'll see ya the next time you're around." He gave her a brief hug and rapidly left the dorm room. "I'll meet you at the van, April," he called out before he found the stairwell. April stared at Allie and Allie stared at April. "This is the day you've been waiting for," April finally said. "You're legally free." "But not emotionally free," Allie sighed, gazed out the window, and turned back to April. "Thank God. I can't believe I once thought I could leave you, all of you, behind without looking back." "It's been three years. We've had time to grow on you." "That must be it. I know I'm going to miss you guys. Even Raph." "He'll probably miss you too, even if you'll never get him to admit it." April sighed. If it was this hard letting go of Allie, how hard would it be to let go of Zack? "I can't say it hasn't been exciting . . . ."
"It's not over yet," Allie managed to come up with a sorry substitute for a smile. "You still have Zack." "But Zack's not you, Allie." Allie paused to consider that. "No, he isn't. Thank God." Her voice cracked under the pressure of the emotion contained in those two words. She took a deep breath. "He could have been, if it had been just me and him." "Could have?" April asked softly. Another bare hint of a smile. "Even I will not be so bold as to predicate the might-have-been's." "That sounds like something Splinter would say," April tried to smile but found herself too close to crying for it to be effective. Allie took a deep breath that caused her whole body to shudder. "Good-bye, April." When the time finally came, Allie was the one who loosened and lengthened the ties that bind. April wouldn't forget that. "Good-bye, Allie, and good luck. Be sure to call if you need anything." Allie nodded, not trusting herself to speak. April paused at the door and looked back. Allie didn't move, a tower of strength. She turned away and headed down the hall. That's what Allie was, a tower of strength. A tower ready to fall from its own weight. She paused at the door to the stairwell. Where had that analogy come from? She shook her head. Must be from all that explaining Shakespeare to Donnie. That had to be it. Sammie waited until she saw that April and Zack had left in the yellow van with the green roof, bumpers, and hubcaps. She sighed and looked up at the building. It was creepy, despite looking so cheerful on the inside. That showed someone on this campus had some sense. But this had appealed to Allie. She sighed again and entered the lobby. This place sure wasn't going to be her social center. To one side, there was an ancient-model wide-screen TV passed on from a time when decorative wood carvings on furniture was considered good taste. The TV had rows of couches and chairs arranged in a worshipping semi-circle. Sammie decided the designer of the sitting furniture must have had a fascination with wooden crates and had probably added the tacky-colored cushions only for comfort's sake. To the other side of the room, there were a pool table, a Ping-Pong table, and a round table with plastic chairs surrounding it between the other two, all waiting for someone to make use of them. An empty aisle separated the two sides of the lobby and led from the main door to the lobby desk, where a bored upperclassman sat chewing her gum and reading this month's Cosmo. Sammie shook her head at the sight and bypassed her altogether, opening the door to the stairwell that was to the left of the desk. Sammie found Allie with a pained expression on her face sitting on the made bed in their room staring fixedly at the wall. "That was the hardest thing I have ever had to do," she finally said. "It's not like you'll never see them again," Sammie smiled easily, trying to put her best friend at ease. A tense Allie was not something she wanted to live with often. Allie twisted her lips into a grimace. "That wasn't what I was talking about, Sam. It's like now," she paused, then stood up and paced the room. "Now everything is finalized and . . . and I can't turn back." She stopped and faced Sammie expectantly. Sammie swallowed as she leaned against the doorjamb and tried not to read too much into Allie's expression. That was the problem with reading Allie's expressions, one felt you were reading too much when in reality you weren't reading enough. "You can always turn back." "Can you always?" Allie demanded. "Can you?" Sammie didn't answer. Allie turned away with an exclamation of disgust aimed at herself. "Where can we set up?" Sammie managed to shrug, "The basement? It's the only floor that's easily accessible without people living on it." Allie snatched her room key off the built-in desk and strode into the pale peach hall. Sammie shrugged, "I guess that's an affirmative HQ location choice." She paused only long enough to shut the door. She knew from experience that just the slightest lingering on the part of the follower and Allie would be gone. The stairwell door creaked and its hinges wedged shut as Allie threw her weight against it. "If this is where they expect us to wash our laundry, they should keep this door in better shape," she grunted. Finally, the door flew open and struck the wall and repositioned itself at a twenty-three-degree angle from that wall. Sammie eased into the room slightly smaller than the lobby above it, peering for a hidden assailant. The door slammed shut behind her and she leaped into the air, clawing her way around to face a grinning Allie. "Tense?" "Easy for you to say," Sammie muttered. "You just didn't suffer from a heart attack." "You're not supposed to have a heart attack with all that healthy food you eat." Allie turned her attention to the two doors leading to their respective ends of the hall. "I don't think what I'm looking for is in Laundry." She turned and considered the other door. "Storage, that's considerably more promising." "I hate it when you say something looks promising," Sammie muttered. Her heart rate was starting to return to normal, but she had a feeling it wouldn't remain there for long creeping around in this basement. Allie tried the doorknob that refused to turn in her hand. "Oh darn, it's locked. Well, let's go finish unpacking." "Since when does locked mean anything to me?" Allie asked lightly as she dug into her jeans front pocket. She pulled out a lockpicking kit and knelt down to be eye level with the lock. "Where did you get one of those?" Sammie demanded. "It was a birthday gift." "Someone who knows you is actually trying to encourage your anti-social, criminal tendencies?" "I didn't say it was a friend that wasn't wanted by the cops." Allie gave it one final twist and the lock clicked. She pulled the door open, shoved Sammie inside, and shut the door as she entered the black room. Sammie gave an involuntary shudder as her hand searched the wall for a light switch. She finally found it and the two rows fluorescent lights revealed a collection of dust mops, mops brooms, garbage cans, cleaning solutions, yellow cleaning carts, and industrial-sized sinks installed against one wall. Most of this was concealed in shadow, since the two rows fluorescent lights were placed above the row of sinks and the windows had been bricked over from the inside. She sighed and turned to Allie, "What are we supposed to be looking for?" But Allie was maneuvering her way through the yellow cleaning carts, heading for the other end of the room. Sammie sighed and followed. Once she had caught up, Allie gestured to a door almost hidden by the shadows. "I think it's a walk-in closet. And I bet everyone has forgotten about it." Without another moment's hesitation, she threw open the door. Nothing came jumping out and Sammie exhaled the breath that she had been holding. Daylight streamed in from a filthy window. Allie stepped in and Sammie had to follow. She reached up and pulled the string dangling for the light bulb. The bulb actually worked and shot light into the corners where the sun didn't reach. Sammie shut the door, only gingerly touching what she had to. "This is perfect," Allie breathed. "This is filthy," Sammie insisted. Allie ignored her and jumped up on a bench to open the ground-level window near the ceiling of the room. "This faces another building. No wonder it got missed when they were covering the other windows." She turned and gazed at the room. "Plenty of shelf space." Sammie turned to the shelves and gulped at the three-inch thick layer of dust and the cobweb mansions. "This is perfect." "This is filthy," Sammie repeated. Allie blinked, "So it needs a little work. But can you see past that?" Sammie tried to do as Allie had asked and shuddered. She wrapped her arms around herself and quickly squeezed. "Allie, I don't like this." "I know you don't like spiders. Don't worry, I'll clean them out." "That's not what I'm talking about! This whole plan; I don't like it!" Allie paused. "Sammie, it's going to work out fine. Just look at it like a big practical joke." "If it's just a practical joke," Sammie whispered, her eyes opened wide. "Who's going to laugh at it?"